Purity has an environmental impact and is strongly connected to worship; without a clean body, a Muslim cannot pray. 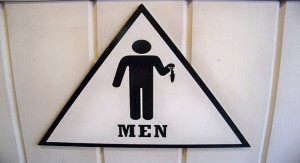 It has become a common practice in many parts of the world for men to stand and urinate. The presence of urinals in almost every male bathroom has not only taught, but also encouraged people to stand up while relieving themselves. What does Islam say about this behavior? First of all, we must remember that our ability to digest food and drink is a great blessing from Allah. We would not be able to survive without a digestive system. However, with every blessing comes a responsibility. Since human waste is classified as impure, Islam teaches us a few rules about how to relieve ourselves with dignity. Public pathways and shaded areas are two areas where people would be offended from excrement and filth because they use them so often. The same curse would apply to those who leave filth behind for the next person. The curse, in this context, has two meanings: people are cursed by the one who has to deal with the dirt they left behind and they are cursed by Allah for their careless and disgusting habits. This is clearly an exception to the rule because the Prophet (peace be upon him) was in a very dirty place. Hudhayfah’s description of the place being a garbage dump reveals to us the context and makes it clear that ‘A’ishah’s challenge was referring to people who claimed the Prophet did it often as a habit. Her challenge still stands today. When someone tries to misquote the statement of Hudhayfah in order to prove that the Prophet used to stand and urinate just as people do today, we should correct it. What should a Muslim do? Muslims should try to combat this immorality in their own community by encouraging good standards of hygiene. We live in societies which claim to be clean and advanced, yet their toilets – the most basic of sanitary developments – are among the filthiest in the world. Visit any gas station, high school, theme park, etc. and experience what happens to the restrooms when there is no full time janitor to clean up afterwards. The messenger of Allah has taught us certain rules to observe which benefit both society and ourselves. It is up to us to be aware of this guidance, learn it and apply it.